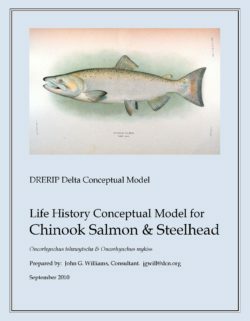 This report constitutes the conceptual model for Chinook and steelhead for the Delta Regional Ecosystem Restoration Implementation Plan (DRERIP). The report describes conceptual models, not numerical models, but several important considerations apply to both kinds, especially when they are used for management of living natural resources. First, the proper purpose of models is to help people think, not to think for them. Ignoring this can be disastrous, as exemplified by the current economic crisis. The world of credit default swaps was built on highly sophisticated models that persuaded many intelligent people that the associated risk was negligible, but they failed to recognize that a market based on houses that people could not pay for from their earnings is unsustainable. In short, the most important output of a good conceptual or numerical model is clear thinking. 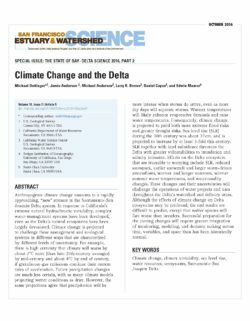 To help people think, the model must be focused on selected features of the world that are thought to be important for the purpose at hand: in this case, management of the Delta. A model that tries to include everything will be too complex to be useful for this purpose. Second, to be useful for management of natural living resources, numerical models must be unrealistic, because our knowledge of such resources is incomplete, and is based on data that includes measurement errors. According to Ludwig‘s paradox, "Effective management models cannot be realistic" (Ludwig 1994:516), because two kinds of uncertainty must be balanced (Figure I-1; see Ch. 14 in Williams (2006) for elaboration of this point). In our view, something similar applies to conceptual models of natural systems: to be useful, they must be simple. A schematic of the wiring in some electronic device is a conceptual model that may be useful as well as complex, but trying to develop a similar schematic of an ecosystem or part of an ecosystem is not useful, because our knowledge of such a system is much less complete than our knowledge of engineered devices, and we have only estimates of the relevant parameters. Finally, reality is too complex to capture with a single model. Eric Lander, a noted geneticist who co-chairs President Obama‘s Council of Advisors on Science and Technology, recently remarked that "You can never capture something like an economy, a genome or an ecosystem with one model or one taxonomy – it all depends on the questions you want to ask." (NY Times, 11/11/08). Models are tools that we use to try to think, and multi-purpose tools generally do nothing well. 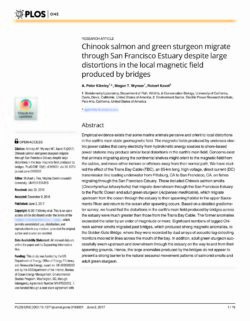 Therefore, although the complete life cycle of Chinook and steelhead is described here, the parts or aspects of the cycle that we think may be affected by management of the Delta are emphasized, and we try to keep it as simple as possible. More detail on most of the topics described here can be found in Quinn (2005), or in Williams (2006), from which this document draws very heavily. 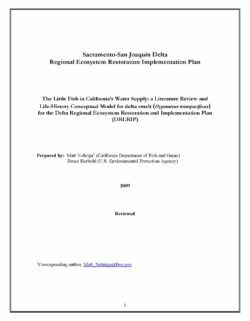 This Conceptual Model is part of a suite of conceptual models which collectively articulate the current scientific understanding of important aspects of the Sacramento-San Joaquin River Delta ecosystem. 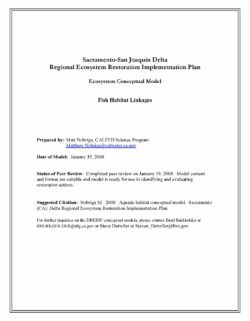 The conceptual models are designed to aid in the identification and evaluation of ecosystem restoration actions in the Delta. These models are designed to structure scientific information such that it can be used to inform sound public policy. 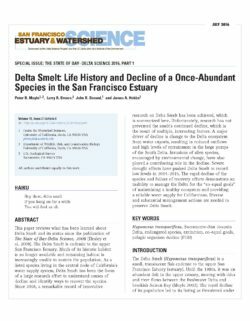 The Delta Conceptual Models include both ecosystem element models (including process, habitat, and stressor models) and species life history models. 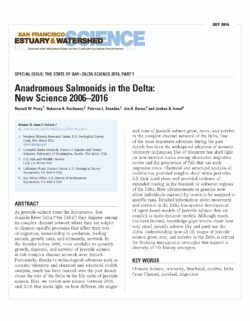 The models were prepared by teams of experts using common guidance documents developed to promote consistency in the format and terminology of the models http://www.delta.dfg.ca.gov/erpdeltaplan/science_process.asp . 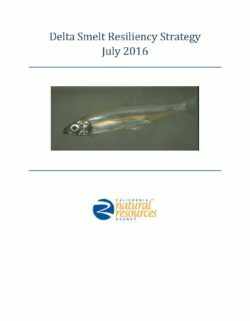 The Delta Conceptual Models are qualitative models which describe current understanding of how the system works. They are designed and intended to be used by experts to identify and evaluate potential restoration actions. They are not quantitative, numeric computer models that can be “run” to determine the effects of actions. 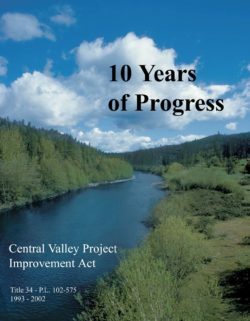 Rather they are designed to facilitate informed discussions regarding expected outcomes resulting from restoration actions and the scientific basis for those expectations. The structure of many of the Delta Conceptual Models can serve as the basis for future development of quantitative models. 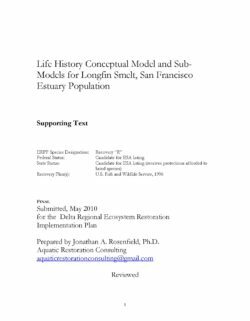 This model describes the importance of stressors on the life history of longfin smelt in the San Francisco Estuary. In addition, the model identifies the degree to which we understand the nature of a relationship between stressors and successful completion of the life cycle (“understanding”) and the certainty surrounding how important a particular stressor is for a particular life stage (“certainty of impact”).